The red Campbell's soup label is an iconic image that consumers might associate with a feel-good meal. Before heating up your next can of Campbell's soup, however, it pays to learn more about the nutritional value of the food. Most Campbell's soup varieties are quite high in sodium, though certain varieties do supply good amounts of key vitamins and minerals. Armed with all the facts, you can decide if Campbell's soup has earned a spot in your healthy eating plan. One primary drawback to eating Campbell's soup is the high sodium content most of the varieties contain. Too much sodium increases your risk of heart attack and stroke. The tomato soup, for example, contains 480 milligrams of sodium per serving. If you adhere to the 1,500-milligram daily limit for sodium recommended by the American Heart Association, the serving of soup is 32 percent of that. The chicken noodle soup contains 890 milligrams of sodium per serving. and the cream of mushroom contains 870 milligrams per serving. One benefit that some varieties of Campbell's soup offer is their fiber content. The Harvard School of Public Health notes that you should try to consume at least 20 grams of fiber per day to keep your digestive system healthy and to cut your risk of heart disease. A serving of bean with bacon Campbell's soup, for example, contains 8 grams of fiber, which is 40 percent of that goal. The chunky version of beef and barley soup contains 4 grams of fiber, and the homestyle cajun chicken, beans and rice soup contains 3 grams of fiber per serving. Opting for Campbell's soups that contain vegetables, pasta and beans is a good way to boost your fiber intake. 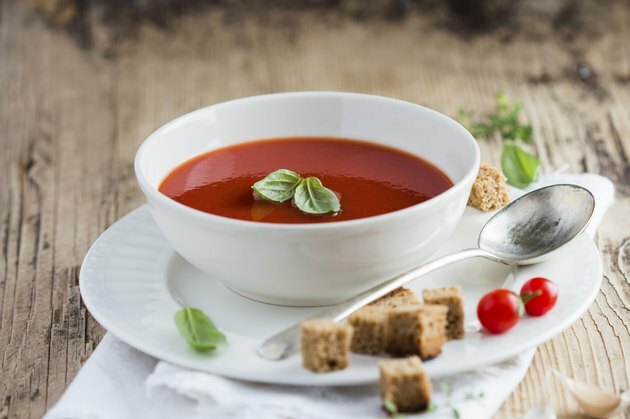 Because certain kinds of Campbell's soup contain vegetables, meat and other healthy ingredients, you get certain nutrients when you eat a serving of the soup. Any soup with meat, such as the vegetable beef, chicken noodle or clam chowder, supplies protein and iron. Soups with vegetables contain small amounts of potassium and vitamin A. The soups made with dairy foods, such as cheese or cream, also boast a small amount of bone-building calcium, though they can also be high in saturated fat. Broccoli cheese and corn chowder are two examples of Campbell's soups with calcium. Limiting yourself to one serving of soup is a good step toward making the food part of your healthy eating plan. The entire can of soup isn't that much food, so it's fairly easy to eat it all in one sitting. When you do plan to have a bowl of soup, consider Campbell's Healthy Request line. These are lower in sodium than the traditional versions. The Healthy Request chicken noodle soup, for example, contains less than half the amount of sodium as the original, at 410 milligrams per serving. Seek out Campebell's low-sodium soup options, as another idea. The vegetable soup, for example, has a more reasonable 115 milligrams of sodium per serving. Pass on or limit the soups with cream and fatty meats, such as sausage, because these tend to be high in saturated fat, which doesn't support heart health. Is Soup Good for Weight Loss? How Many Calories Does Pho Soup Have?